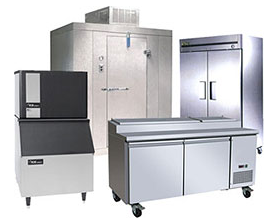 Precision Air Systems, Inc. provides service, repair and installation for all brands of COMMERCIAL Refrigeration Equipment. Our technicians are trained to diagnose and fix any problem you may encounter with your commercial refrigeration equipment. Routine preventive maintenance can significantly reduce the chance of food borne illnesses and avoid costly repairs. Regular commercial ice machine maintenance/cleaning schedule is critical to combat mineral deposits and slime build-up inside the machine.